The rotator cuff is quite an amazing area. The rotator cuff is a group of four muscles and several tendons that cover and protect the upper arm area. The rotator cuffs do so much for the upper body, but unfortunately are often overlooked. The rotator cuffs are crucial to shoulder mobility and stability. With that in mind I don’t think I have to stress how much you use the rotator cuffs when weight training the upper body. Rotator cuffs play a major role in exercises where the shoulders are stressed a lot. The bench press is probably the most infamous of all exercises for the stress it places on rotator cuffs. It is also probably the most infamous for the damage that it also causes some trainees rotator cuffs. Because of the position the bench press places the shoulders in, stability and strength are very important when benching. Almost all of this stability comes from the rotator cuffs when benching. If your rotators are not strong enough to handle the workload you could be in some serious trouble when bench pressing. It is like the old saying goes. “A chain is only as strong as it’s weakest link!” One thing to remember though is just because rotator cuff injuries seem to happen most often with bench pressing, bench pressing is not the only culprit. Rotator cuffs can be just as easily injured from military presses, tricep pressing exercises, a variety of upper body movements and even squatting. When a rotator cuff is injured, it is usually in the form of a tear or an impingement. A rotator cuff tear occurs when one or more of the tendons that make up the rotator cuff gets injured. These tendons connect the muscle of the rotator cuff to the bone. Once these tendons are injured, shoulder mobility and stability becomes very difficult. A rotator cuff impingement is the limited movement of part of the rotator cuff due to injury. The rotator cuff will only move a certain amount of degrees once the impingement happens and trying any further movement usually causes pain due to inflammation in the area. Now that we know the damage that can be done from not having your rotator cuff strength up, what can we do to help our rotator cuffs? The best way to prevent rotator cuff injury is by building rotator stability and flexibility. Since rotator cuff muscles are more of stabilization muscles, building up your rotator cuffs is not going to be like building up your bicep muscles. Rotator cuff muscles and tendons are small muscles and vulnerable to injury when overstressed. You always want to work your rotators in a moderate to high rep range. You also want to use moderate to light weight when training the rotators. Going to heavy when training the rotators can be just as damaging as not doing them. It is the same as the bench press concept. Your rotators will crumble because they can’t handle the stress put on them. This is one case where more is not better! Let’s take a look at four exercises that can help build up your rotator cuffs. The Bradford Press- This is an “old school” exercise that you hardly see anyone do today. The Bradford Press tends to get a bad rap for being dangerous. The fact is the Bradford Press is a great exercise for increasing strength and mobility in the shoulder area. Why people consider it dangerous is because most people perform it incorrectly. Take a seat on a nice stable seat or bench. Get yourself a bar and take a shoulder width or slightly wider grip. Use a weight you can manage for 15-20 reps. Lift the bar to chin height. In traditional military press form, begin to press the bar overhead. Once you get the bar about 4-5 inches above your head begin to move the bar over your head and backwards till it clears your head. Make sure to keep your elbows in and slightly up while doing this. Once the bar is behind you, you want to begin to do a behind the neck press. Bring the bar down to about your ear level. Do not lower the bar any further than this! 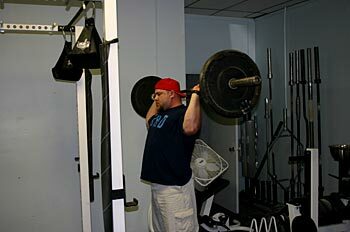 Once you have the bar at ear level, begin to raise it and reverse the motion. 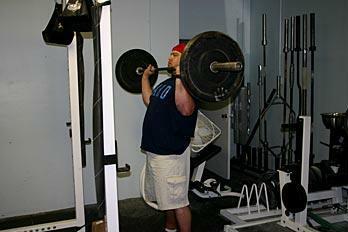 Once the bar is in front of you again bring it down to ear level in the front and that is one completed rep. Complete 12 reps. The L Rotator- This exercise probably places the most direct work on the rotator cuffs. This is a tough exercise so you will not need a lot of weight at all. Depending on your rotator cuff strength anywhere from 2-15 pounds should do the trick. After a few weeks of doing this exercise, you will notice a big difference in rotator cuff strength (especially when bench pressing). Take a seat on a nice stable seat or bench. Grab yourself a pair of light dumbbells. 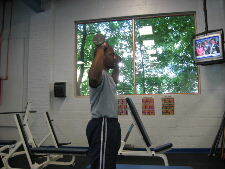 Lift the dumbbells up in position like you are going to start to do a overhead shoulder press. Lift your arms slightly so they each form an “L” when holding the dumbbells up. You want your arms to make a perfect 90 degree angle. The top half of your arm will run parallel to the ground and the bottom half of your arm will be perpendicular to the ground. Once your in this position, you want to slowly rotate your arms forward. Rotate your arms down until the top half of your arm is now parallel to the ground. Now rotate back to starting position and that is one rep. 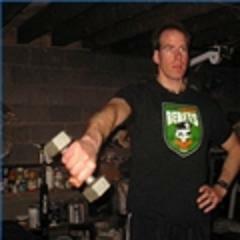 Complete 12 reps.
Thumbs Down Lat Raises- This is another great exercise for hitting the rotators. It may feel a little awkward at first but definitely worth doing. Stand up and grab a pair of dumbbells. When you grab your dumbbells you want to make sure your thumbs are pointed down. With one dumbbell on each side and thumbs pointed down, slowly begin to lift the dumbbells upwards and outwards. Try and lift your arms till they are almost parallel to the ground. How high you lift your arms will depend on your shoulder flexibility. Once you lift your shoulders as high as you can, slowly reverse the motion till the weights are back by your side. One the weights are by your side again you have completed one rep. Complete 15-20 reps.
Over Head Front Raiser- This exercise is great for increasing strength and mobility in the front part of the rotator cuff. Don’t get overzealous with this exercise because it is tougher than it looks. Again with this exercise you want to keep the weight light. Make sure your using your front delts and rotator cuffs and not swing momentum from your back. This exercise can be done with either barbells or dumbbells. If either of those are too heavy, try using a broomstick. Grab a barbell about shoulder width apart in front of you. Place a small bend in your arms. Slowly raise your arms straight out in front of you. Continue to raise the barbell until it is over your head. Slowly begin to lower the weight back down until it is at starting position again. Once you’re at starting position again you have completed one rep. Although the rotator cuff may not be the most attention getting area in the upper body, the rotator cuff area is one of the most important. The rotator cuff provides stability and mobility to the shoulder area and when that is impaired even the simplest task can be quite arduous. By routinely performing some exercises that strengthen the rotator cuffs you take a big step towards injury prevention. 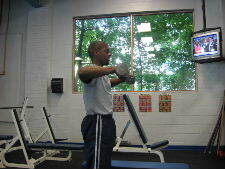 You will also develop more strength in other exercises due to your rotator cuffs increased work capacity. So get out there and start working your rotator cuffs. It will take a load off of your shoulders….literally!